This is a play list of all the current video’s available on American Giants youtube channel. The episodes run from 8 to 15 minutes each and cover different muffler man trips and discoveries across America. Each season will have 10 episodes in it. New Episodes are added roughly once a month. All release dates are subject to change due to my crazy work schedule. In this first episode of American Giants, the crew sets out for old route 66 in Illinois in search of the muffler found on or near it. Along the way they visit what is known as a soda jerk and learn it’s connection to muffler man. Roadside America is also introduced in this episode and the huge part it plays in the history of muffler men. This second episode follows Bo, Neto and Joel as they continue up old route 66 in Illinois. They stop in the town of Springfield to visit what has become known as the Lauterbach muffler man and discover his interesting history as well a few T shirts given to them by the owners. In this episode the crew continues their journey up old route 66 towards Chicago stopping in the small town to Atlanta, IL. They discover the interesting clock tower and laundromat as well as the gunner mast trading post and Palms Cafe. In the center of town stands the hot dog holding muffler man that once stood in Cicero and they learn his interesting history and the story of his move to Atlanta. The American Giants crew arrive in Peoria, IL to visit one of the rare female versions of muffler men called Uniroyal Gals. 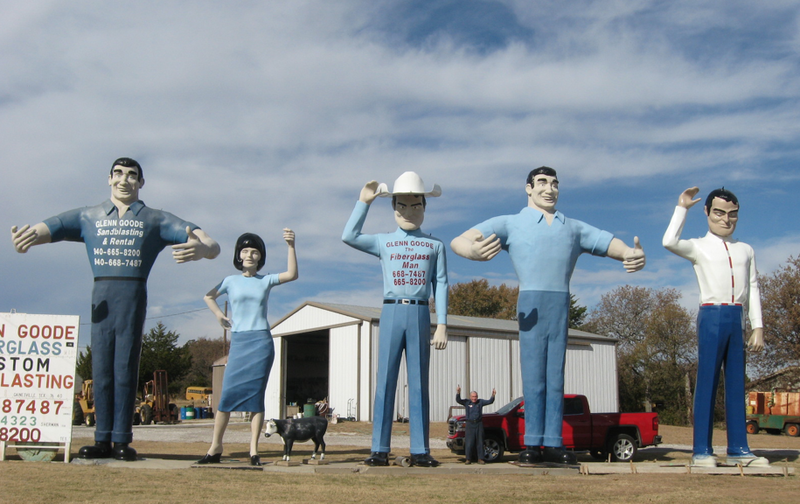 They visit her owners at Plaza tire and then make their way to one of the most famous muffler men standing in Wilmington, IL called the Gemini Giant. Part 2 of our Chicago trip finds us leaving the Green House of Crystal Lake and heading a few miles away to Lumberjack firewood and mulch. Joel has a hunch that this is the old Wolff Flee Market Bunyan and we soon find the answer. The crew also visits Lambs Farm in Libertyville and discovers what this unique organization is all about and also checks out their muffler man. In Chicago Part 3 the crew continues to make their way into the heart of the city. They learn about the Mr Bendo version that IF made and visit one missing his head in downtown Chicago. They made an interesting discover while searching for his head before finally stopping at the Eye Care Indian on Pulaski that has been a long time Chicago local landmark. In part 4 of our mini Chicago series and also the last episode covering our first road trip, the guys visit two more muffler men. We first stop in Evergreen Park to visit the Bunyan located on the roof of Guardian Auto Rebuilders. Then we make our way over to Haunted Trails and check out the mutant muffler man that looks like Frankenstein. The go pro comes out again and produces some unique angels on the giant. The Episode ends with a recap of the entire trip and a preview of our next episode. When the episode was recorded I was under the impression that the Frankenstein was made by FAST. However FAST only came into existence in 1983 and before that the company was known as Creative Display. It is most likely that Creative Display made the giant in 1977. The American Giants crew sets off on a new adventure to Dodge City Kansas in search of the Dennis Hopper Muffler Men! After a grueling drive the guys stumble into town and meet not only the two giants but the many people behind the scenes that helped get them to their new home in Dodge City. In Part 2 the guys continue their quest to learn the history on the Dennis Hopper Muffler Men and interview more people at the 3I show who have been instrumental in getting them to Dodge City. They also discover Dodge City used to have their very own Phillips 66 cowboy and try to track it down! Joel and Neto tackle a huge Muffler Man road trip from Phoenix to Hayward and end up at Bell Plastics to check out Bruce Kennedy’s growing collection of Muffler Men. They are in for a bunch of fun and surprises as they discover one of the rare Santa’s that International Fiberglass made as well as just how many Muffler Men Bruce wants to collect! After leaving Dodge City the guys seek out other muffler men in Kansas leading them to Browns Tire in Wichita and a muffler man head in Hutchinson. They meet with owner of the muffler man head “Greg Holmes” and find out how one goes about obtaining a muffler man head and the many uses you can make of one. Joel and Sam make an interesting discovery in a small Missouri town and dig up some old history on what used to be Jesse James Territory in Sullivan, MO and it’s connection to muffler men and International Fiberglass. Also meet Terry Nelson former International Fiberglass painter and hear firsthand his memories and recollections of working for IF in the late 60s and early 70s. Joel visits an unlisted Uniroyal Gal in rural North Carolina and discovers a entire collection of fiberglass figures. The owners tell the interesting history behind their 3 Uniroyal Gals and introduce us to the future Graham Land. In this special episode we will look into the history of the Texaco Big Friend. 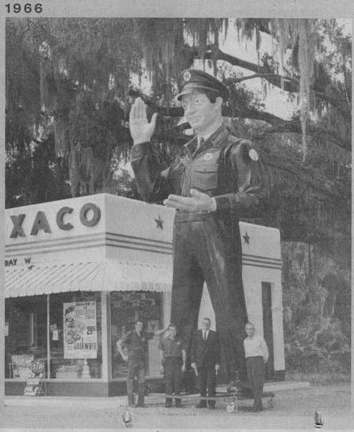 We will follow the story of how Texaco ordered 300 of them from International Fiberglass in 1965 and set up the giants all across the country. After only a few months they suddenly all disappeared except for 4 that we know of that escaped the scrappers yard. Join us as we travel to visit the last remaining big friends and look for clues to their disappearance. 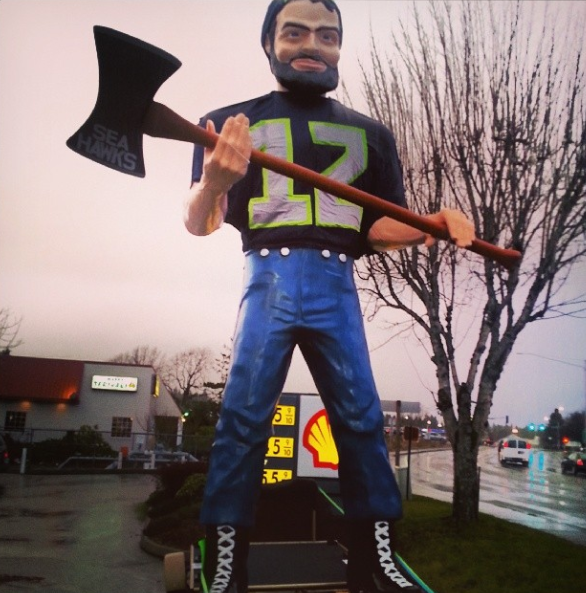 As many towns do, Shelton Washington has a Paul Bunyan Muffler Man dating back to the 1960s. In recent years his care has fallen into the hands of one of the school boys that walked by him everyday back when he was brand new. In this Episode Loyd Prouty gives us a behind the scenes look at his unique mobil Muffler Man. In this episode Joel visits Tampa Bay Florida and talks with Steve Torregiante who runs 8 different “Big Mechanic” shops in the area. Steve started collecting Muffler Men to stand at his shops and so far he has four of the giants. We will hear the story behind each of his giants and look at their history. Steve is still on the hunt for more Muffler Men! 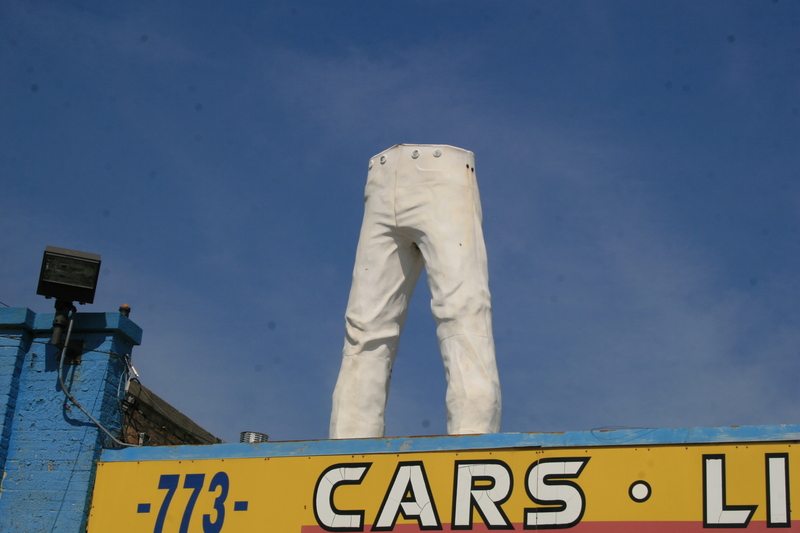 One of the most interesting unfolding stories in the Muffler Man world has been the Mr Bendo in Chicago, IL. 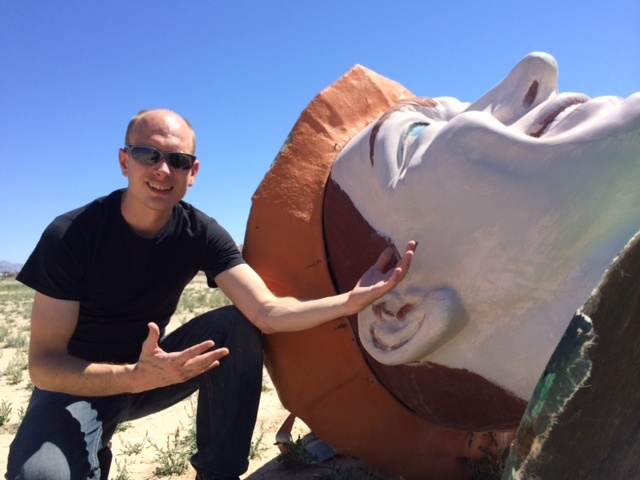 In Season #1 Episode 7 the American Giants crew found the missing head laying on the roof behind the giant. Shortly after however the head disappeared and finally the legs also vanished in late 2014. Join us as we track down this elusive Muffler Man and shed some light on his secrets. 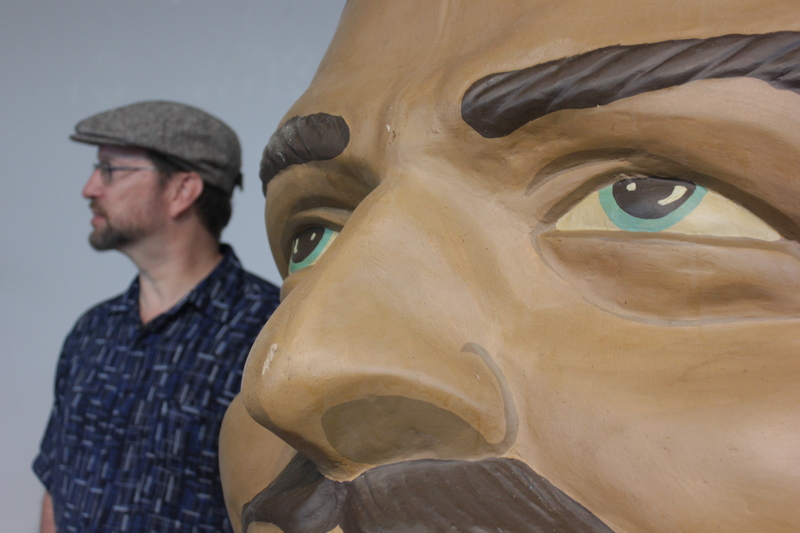 Join Joel as he travels to Gainesville Texas to get the full story behind Glenn Goode and his line up of fiberglass giants. Glen started collecting Muffler Men long before they were considered rare or important. In this episode Glen sits down and tells us how he got each one of his giants and shows us pictures from when he started his quest in 1971. Sadly Glenn passed away just a month after we sat down with him for his interview. The family wishes us to continue with the plans to tell his story. The season finale is the long awaited Mortons Gap Documentary. 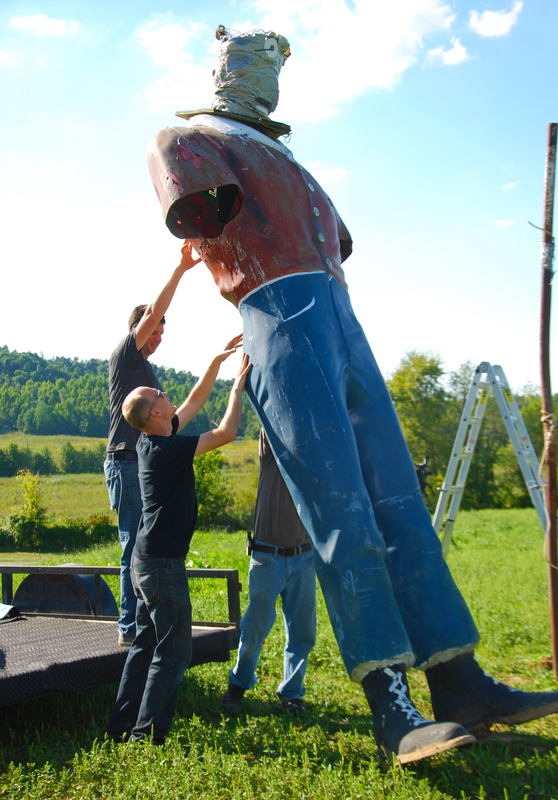 Follow Joel and the American Giants team as they seek to rehead and rearm and sad old Muffler Man in rural KY. As they start the quest more and more people jump onboard and support the project until it becomes one of the largest ventures to restore a Muffler Man. 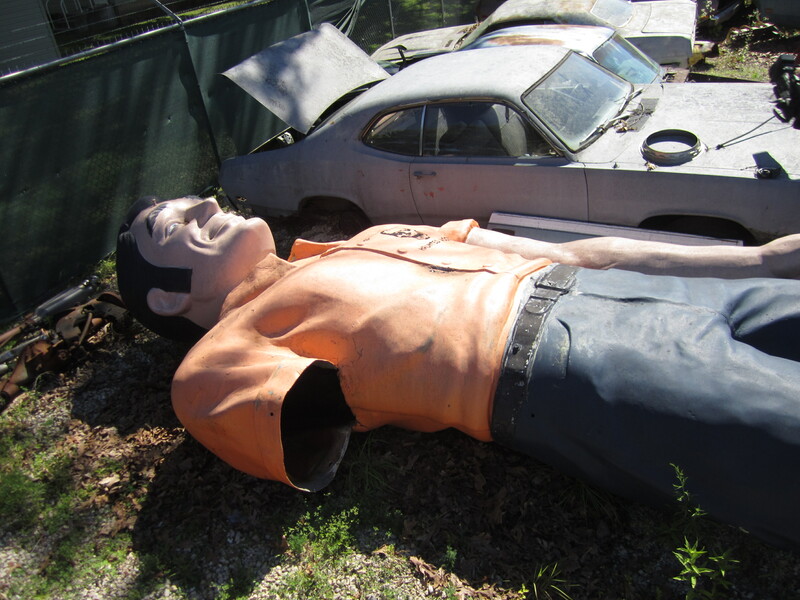 Follow along from idea conception till full restoration of the Mortons Gap Muffler Man in this special documentary. At this time there are no plans for a third season. Thanks for all your videos ,can’t wait for the new ones.One of your biggest fans. Thanks Danny for watching our episodes! I’ve had a super heavy work load so Episode #9 covering our trip to Dodge City keeps getting pushed but we are working on it! Also keep an eye out for our kickstarter project coming up to help rehead and arm a KY Muffler Man. South Carolina muffler man is now moving to Grove Oklahoma. I will post pictures when I get him in place. Watching the Youtube channel now. Did you ever make it to NJ? I live within 45 mins of 3. Well 2 and a UniRoyal girl. Thank you for these wonderful episodes…my sister and I do road trips all over the country and have tracked down several of these big guys (and some gals). Love the interviews and additional info you provide. I even have a scrapbook dedicated to all of the Muffler Men we’ve seen. Hope you are able to continue your videos! Maine has a couple of giants, though not “muffler men,” as you define them. One is a very large Paul Bunyan on a highway approach to Bangor, Maine, that has been there for a very long time. More impressive is the wooden, Skowhegan “Indian,” hand-crafted and painted by Bernard “Blackie” Langlais, a well-known artist (long deceased) represented in many regional museums with large-scale figurative works. Not sure if you track such things but these two are vintage examples of such roadside attractions. 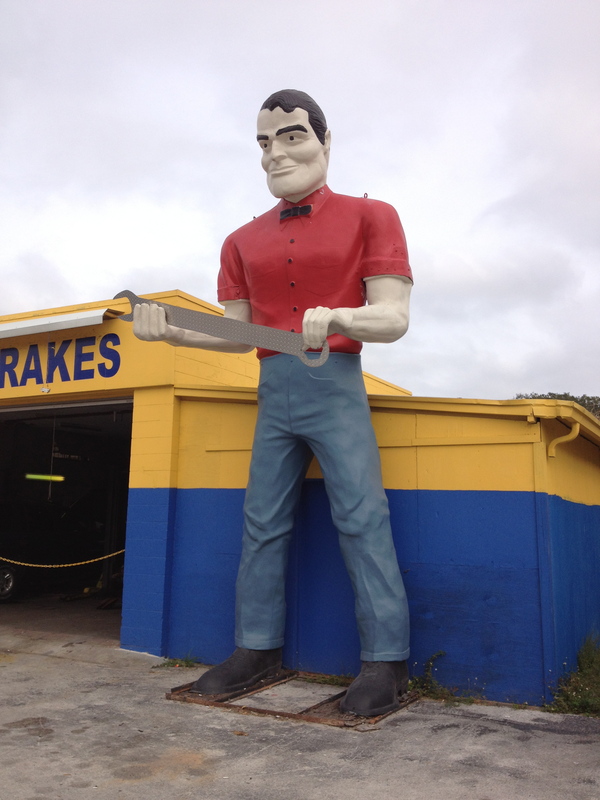 Yes I keep my eye on all roadside giants although I am especially fond of Muffler Men. I have yet to visit Main and all your giants. Looking forward to the trip when it happens and thanks so much for the information and for visiting our site! Dear Joel, me and my roommate LOVE your American Giants series on YouTube. You should absolutely be proud of what you have created. We would like to than you for your insight in documenting your travels across Ametica. Along with gratitude, however comes a certain sorrow. When will new episodes be released to the viewing public?!? Since today (Decrmber 22 to be exact) is our shared birthday we beseech you: release the tapes! The public wants more American Giants! I’m trying to be funny, but our love is sincere! Be our hero Joel, be an American Giant! That was hilarious, thanks for your letting me know you enjoy the episodes. I really want to get back to the episodes! I made the last one about a year ago, and although you can see I have many more already shot and lined up, I have yet to edit them. We got really busy doing restorations this last year and the regular episodes took a break. Your not the only ones who have beseeched me to continue the episodes. They do take an amazing amount of time to shoot and edit so we have been trying to come up with donors to sponsor each episode. While your waiting you could have a look at our restoration videos, check them out at the bottom of the restorations page on the web site. Also be sure and follow us on facebook and instagram. I post almost every day on both of those. All the best! Did you ever do and episode or blog post about the Paul Bunyan in St. Maries, Idaho? Not yet, we hope to start doing episodes again later this year and there is high demand for one of Texaco Big Friends (like the one in St Maries) I have been there and shot everything, just need to make the episode.